From the East & South: Leave the M62 at junction 6 and take the M57 to Switch Island. At the end of the M57 take the A5758 (signposted Southport & Formby), remain on this road through Switch Island and go straight across the traffic lights at the junction with the B5422, remaining on A5758. At roundabout, turn left on A565 (signposted Liverpool, Bootle & Crosby). Remain on this road through Thornton, straight on at 3 sets of traffic lights and at the roundabout remain on the A565, signposted Bootle & Liverpool. 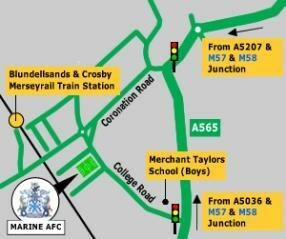 At the traffic lights in Crosby village, turn left onto the A565 (signposted Bootle & Liverpool). After ½ mile you will pass Merchant Taylors school on your right hand-side, turn right at the traffic lights onto College Road. The ground is half a mile on your left. From the North: Leave the M6 at junction 26 and join the M58. Travel along the M58 to Switch Island at the end. Follow signs for A5758 (signposted Southport) and follow directions above. Bus - The Marine Travel Arena is close to a number of bus stops. The 63 (Bootle - Fazakerley) stops on College Road, the 53 (Liverpool to Crosby) stops on Coronation Road, the 47 (from Liverpool to Crossens) and X2 (Liverpool to Preston) have stops near to the ground on Liverpool Road (about 10-15 minute walk from Merchant Taylor school to the Marine Travel Arena). Train - The nearest railway station to The Marine Travel Arena is Blundellsands & Crosby on the Northern Line (Hunts Cross to Southport) of Merseyrail. Trains run at 15 minute intervals from Liverpool City Centre and Southport. The station is a 10 minute walk from the ground. Approximate train journey time from Liverpool City Centre stations to Blundellsands & Crosby is 20 minutes.